Pours a dark brown color with a medium top of beige head that dissolves in a rapid pace. Aroma is of caramel,tofee,prunes,raisins, dates and brown sugar. The taste is sweet and fruity with strong roasted tones in the back. Good notes of dried fruits and caramel. The finish has a slight bitterness that is balanced very good with the malts in the back, and has a good lenght on the aftertaste. Mouthfeel is creamy and smooth with a medium carbonation and medium body. A very good beer, and a great example of it,s style. Aged around 6 months : Cloudy and veiled dark brown with a red hue, extremely active. Creamy brown 1-2 finger head, lasting around 10 minutes, with not much legs but good lacing and a decent swirl reaction. Flavors of cinnamon, brown sugar, caramel, wild berries, cherries, roasted grains, Belgian yeast, coriander, ginger, and herbal hops. Slick and silky medium body with prickly and crispy carbonation. Strong strength finish, malty and bready, thick esters and spices, a bit leafy with sharp yeast, lightly sour from the aging process thats far from excessive. Moderately alcoholic. Pleasantly spiced and yeasty, including a hint of barrel aged feel of cheese. Fits well in winter time celebrations having of festive qualities. Decent freshness and bodied. Highly warming, could easily be used as an appetizer, it's salivating with sugars. Complex and really well made. Aged well in the bottle. Overall excellent quality craft. Poured from 0.33l bottle into goblet. L: Turbid dark brown with a weak white foam head. S: Plums, black berries, red wine. F: Tight body and low carbonation. O: Very good dark ale with unusual taste. Dark amber color with beige head. Aroma has dark malts, brown sugar and molasses. Taste starts yeasty with dark malts, just a hint of sugar sweetness and some dried fruits. Finishes quite bitter and earthy. Medium body and carbonation, well hidden ABV. Overall it's a nice belgian dark ale. Although I am not a fan of this style, I enjoyed this one. What makes this different than the competition? Belgian yeasts working the barley to create fruits is done well... but also beyond my comprehension. 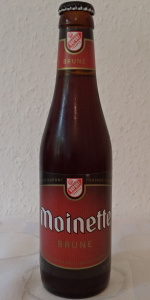 So if you find Moinette Bruin, buy it and figure it out yourself. MJ's "Great Beers of Belgium" has this to say: "The Brune, sweeter and more perfumy" (than the Blond) with the same alcohol content. Look: It pours amber with a full head. It is mostly clear, the head is off white and takes a white to disappear. Smell: There are aromas of plums, apples, toast, cherries, and a bit of rose. Taste: It has flavors of toast and caramel with raisins, apple, and plums. Feel: It has a medium feel and has moderate carbonation. It has a dry finish with a touch of tart. Overall: It is a strong malty and fruity Belgian ale that feature plums and raisins with a quality malt backbone.